Born and educated in Australia, Judith was involved in a different career when Jean-Pierre Rampal heard her play and suggested she become a professional musician. She studied with him briefly in France before moving to London. Her debut in the Park Lane Group's "Young Musicians and Twentieth Century Music" series on the South Bank was very warmly received, and she immediately joined the Orchestra of the Royal Opera House, Covent Garden, as Principal Flute. After seven years she left to give more time to solo and chamber music, having been launched as a winner in the ISM/Nat West Festival Days competition. Orchestras in which she has played as guest Principal Flute include the London Symphony Orchestra, Philharmonia, English Chamber Orchestra, Royal Philharmonic Orchestra, BBC Concert Orchestra and English National Opera. As a member of chamber groups such as Lontano, Endymion, Koenig and Composers' Ensemble, she has performed in Britain and abroad, also broadcasting for the BBC. As a soloist in concertos she has performed and recorded with the Philharmonia, BBC Concert Orchestra, Langham Chamber Orchestra, Gulbenkian Orchestra, Montepulciano Festival Orchestra, Ten Tors Orchestra, Divertimenti of London and the English Symphony Orchestra, among others. As a recital soloist she has played frequently in major British venues, with live BBC recordings from St David's Hall, Cardiff, the BBC Concert Hall and the Pump Room, Cheltenham. She has been heard in British festivals such as City of London, Three Choirs, Dartington, Great Elm, Leominster, Musicfest Aberystwyth, Aldeburgh Proms, Taunton, Arundel, Brighton, Harrogate, Vale of Glamorgan, Swansea, Gower, Machynlleth, Newbury Spring Festival, Calstock, Budleigh Salterton, Ryedale, Salisbury International and Cheltenham International Festivals. Abroad she has played in festivals in Turin, Montepulciano, Middelburg, Halle, Como, Adelaide and Sydney, as well as undertaking tours of France, Germany, Belgium, Holland, Italy, Scandinavia, Spain, Portugal, Greece, India, Australia, the Bahamas, and many parts of South East Asia, with many tours funded by the British Council. 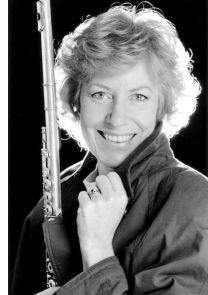 She teaches flute at Birmingham Conservatoire and is also a teacher of the Alexander Technique. With funds from the Arts Council she has commissioned many new pieces for flute, including Jonathan Lloyd's virtuoso theatre piece 'The Apprentice's Sorcery', broadcast by the BBC from the Cheltenham International Festival.